Выкатка прототипа A400M состоялась в июне 2008 года, первый полет ожидается в 2009 году. 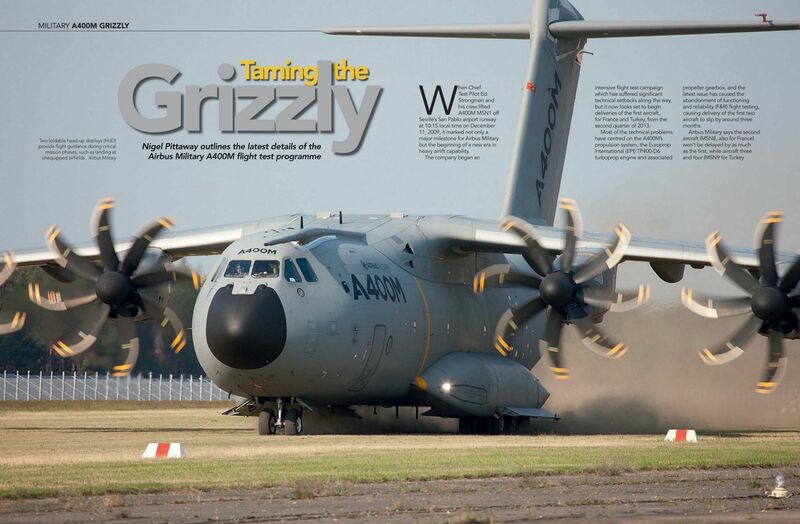 The third prototype Airbus Defence and Space A400M Grizzly F-WWMS (msn 003) has been used by RAF crews to undertake training on the type at Seville, Spain. 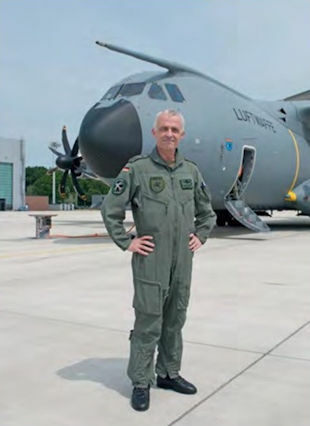 A number of touch-and-goes were conducted on September 11, 2014 with a mixed Airbus and RAF crew. 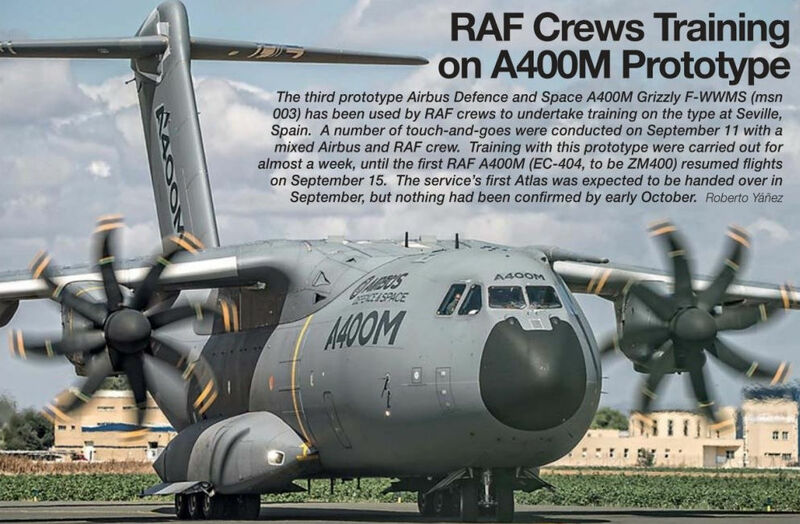 Training with this prototype were carried out for almost a week, until the first RAF A400M (EC-404, to be ZM400) resumed flights on September 15. 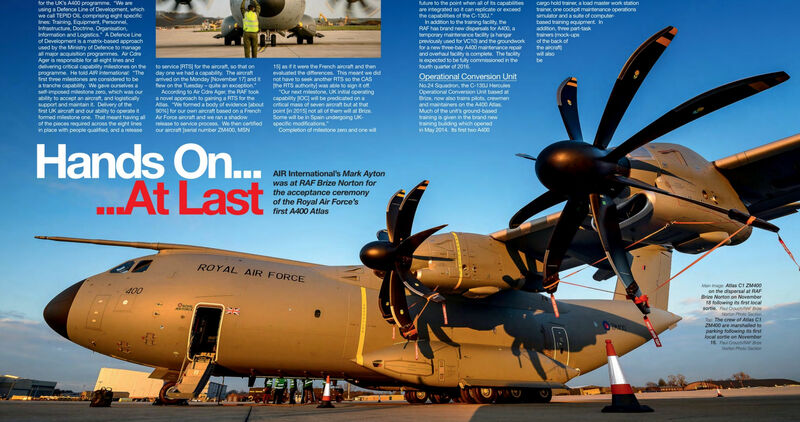 The service's first Atlas was expected to be handed over in September, but nothing had been confirmed by early October. 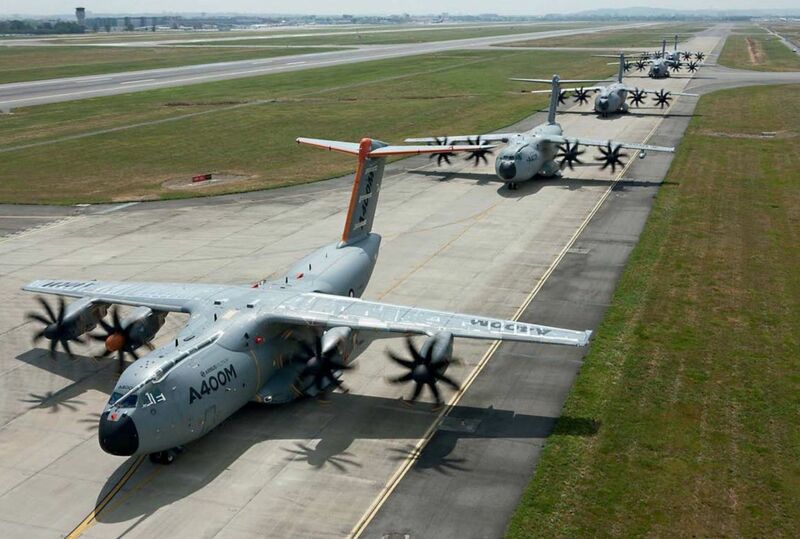 All five A400M built to date perform a 'Grizzly Walk' at Toulouse. Two foldable head-up displays (HUD) provide flight guidance during critical mission phases, such as landing at unequipped airfields. 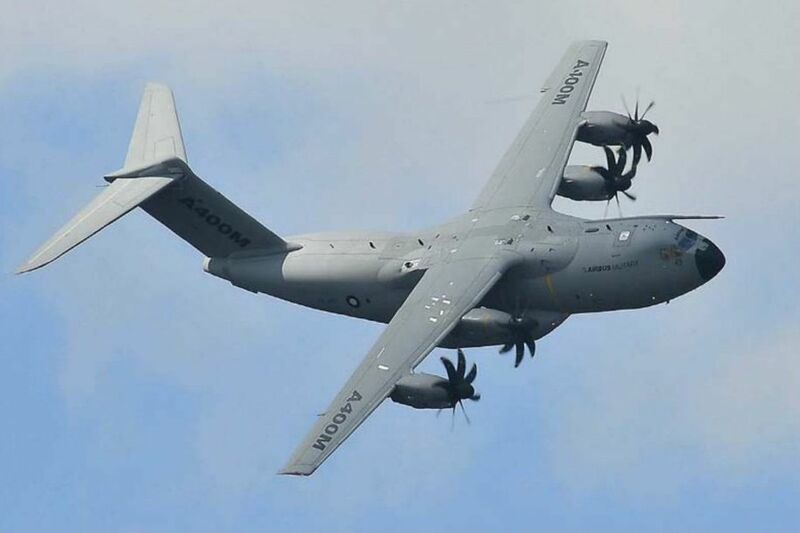 A400M EC-402 fitted with a Cobham 908E air-refuelling pod, on final approach to Seville International Airport on May 29, 2013. 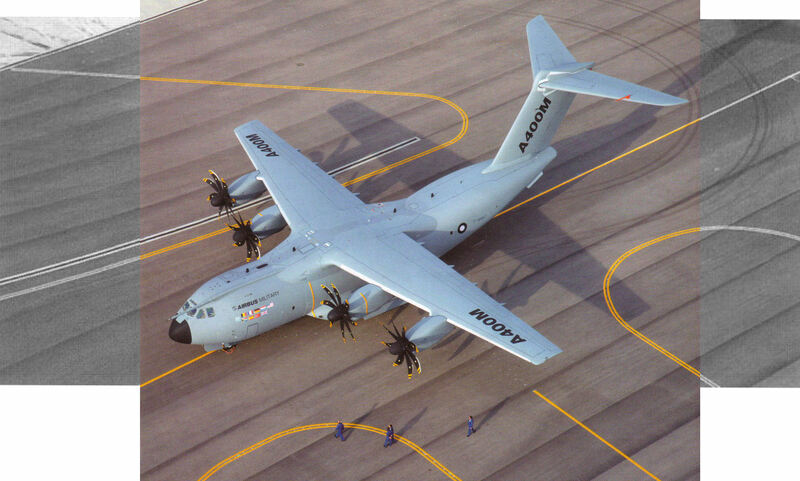 A400M EC-402 MSN2, the second flight test aircraft was handed over to Airbus Military's flight test department in Seville on March 6, 2010. VC10 играли важную роль при летных испытаниях новых самолетов. 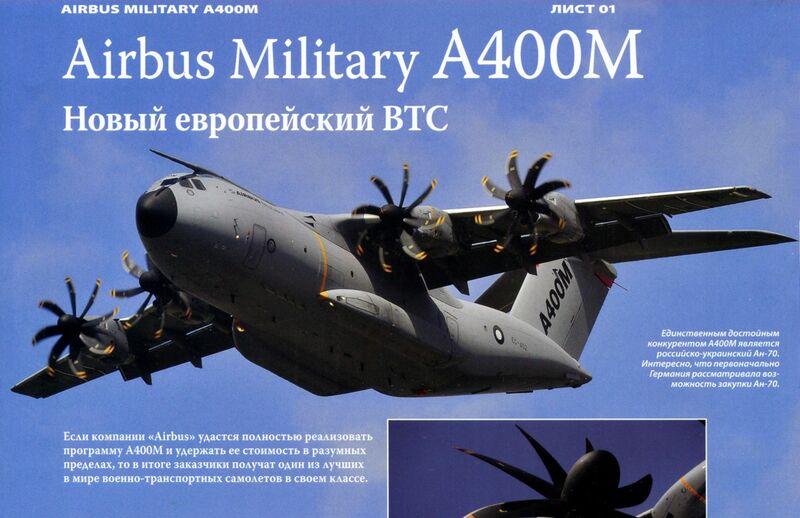 На снимке: BTC Airbus Military A400M получает топливо от VC10 K.Mk 3. 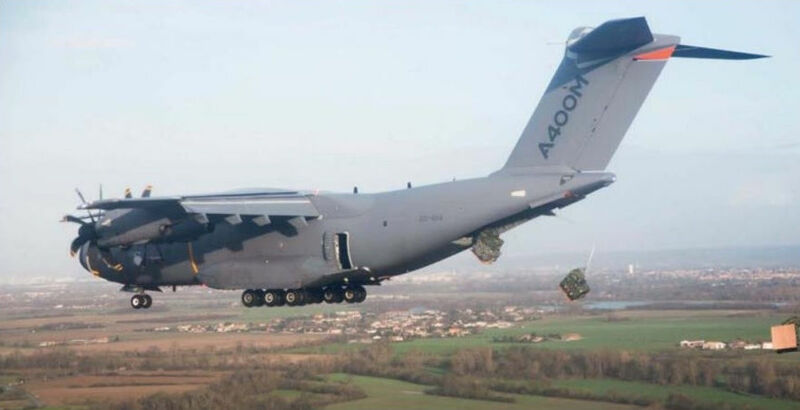 An A400M dropping 24 one-tonne Container Delivery Systems in a single pass at Cazaux in September during airdrop tests. 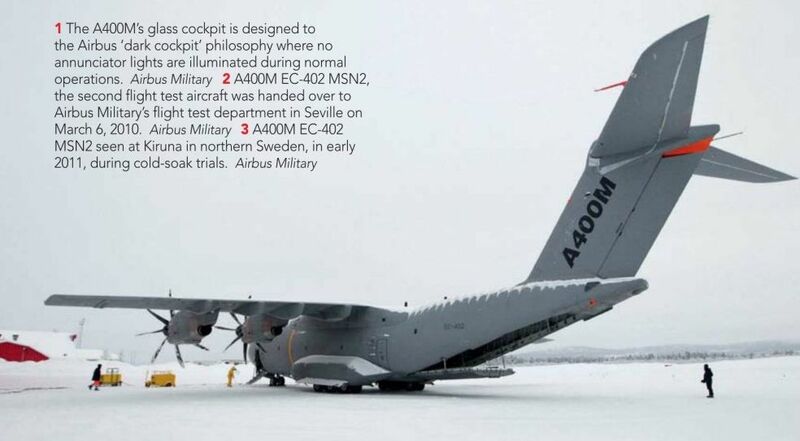 A400M EC-402 MSN2 seen at Kiruna in northern Sweden, in early 2011, during cold-soak trials. 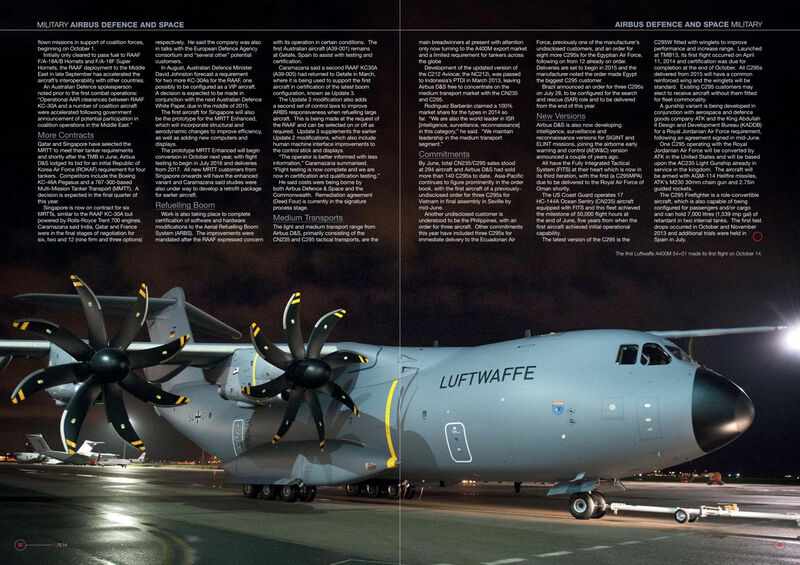 A400M F-WWMS bathed in lights during the ceremony at Seville on September 30, 2013. 15 января 2013г. 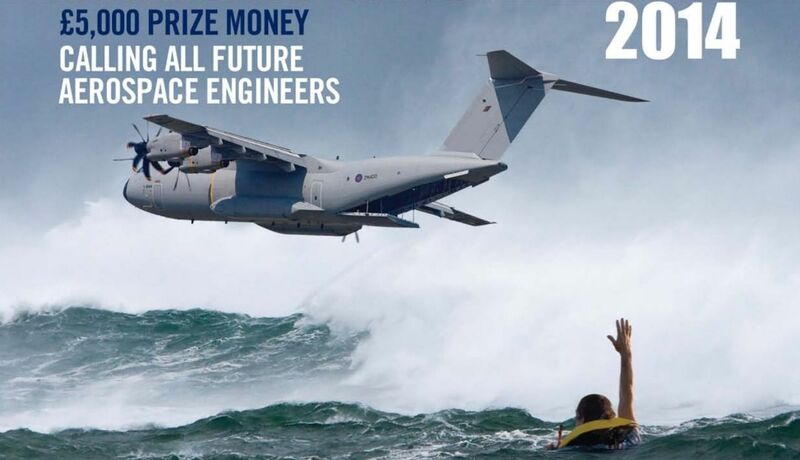 компания Airbus Military сообщила, что на авиазаводе в испанском г.Севилья состоялась выкатка первого серийного экземпляра европейского BTC A400M. В июне этот самолет (MSN007) передадут ВВС Франции, которые до конца года получат еще две серийные машины (MSN008 и MSN010). Кроме того, самолет (MSN009) будет поставлен Турции. 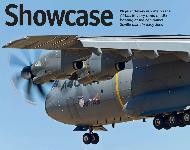 Airbus Military rolled out the first production A400M for the Armee de I'Air (French Air Force) from the final assembly line at Seville in Spain on January 15, 2013. 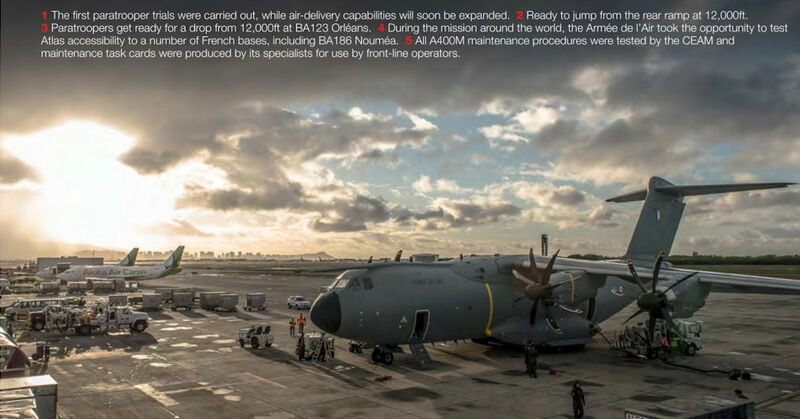 France has ordered 50 A400Ms, of which eight will be equipped as multirole tanker transports. The aircraft (0007, msn 7) is scheduled to be delivered in the second quarter of this year. Initial examples of the transport were originally due to enter service in 2009. 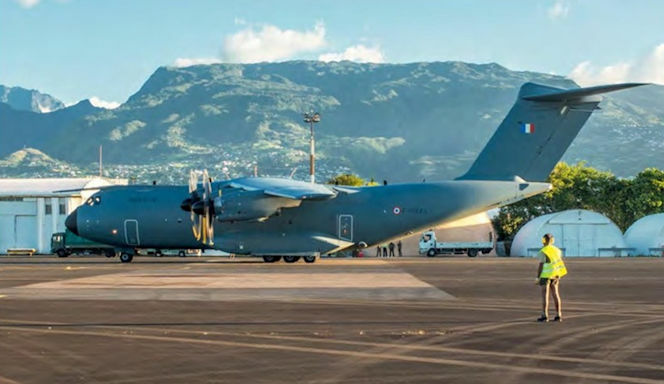 The Armee de I’Air regards the A400M aircraft as an expeditionary asset, able to deliver cargo and troops in a matter of days, which will have an impact on operations in Reunion. 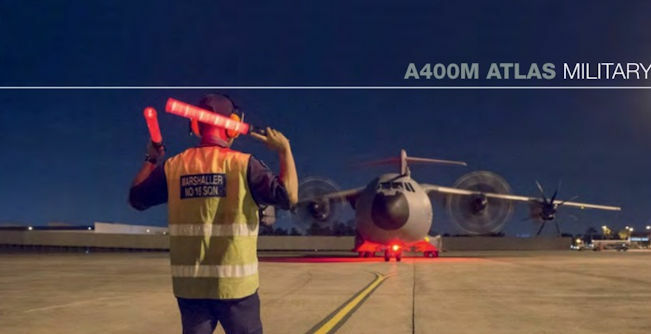 An A400M is marshalled onto its parking space for the night at Subang Air Base, Kuala Lumpur. Two engines have already been switched off. 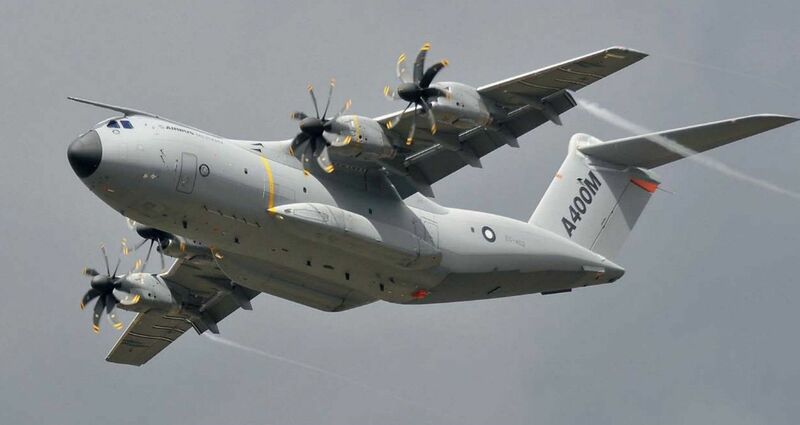 The first visit of an Armee de I'Air A400M to Iraq (Bagdad and Erbil) took place on April 23, 2017. 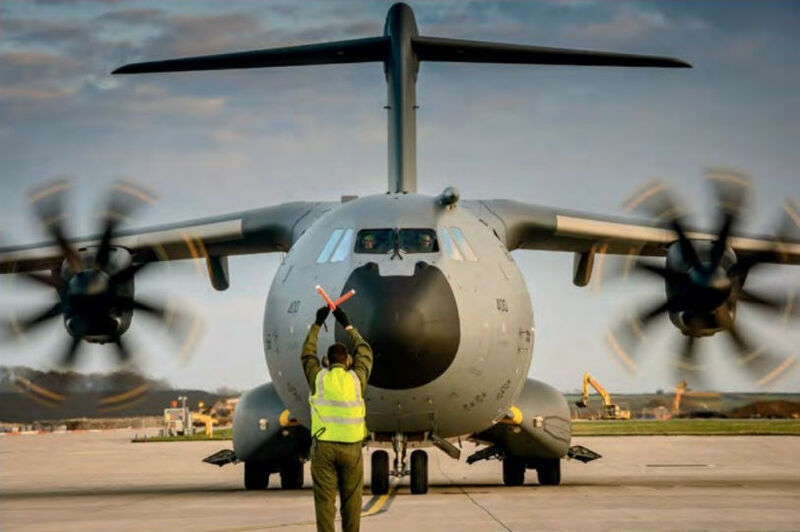 Despite the problems that have affected the A400M, the aircraft’s capabilities and service record has already started to win it the affection of its pilots and crews. In September 2017, two A400Ms from ET 1/61 ‘Touraine’ flew personnel, equipment and supplies to the Caribbean in the aftermath of Hurricane Irma. 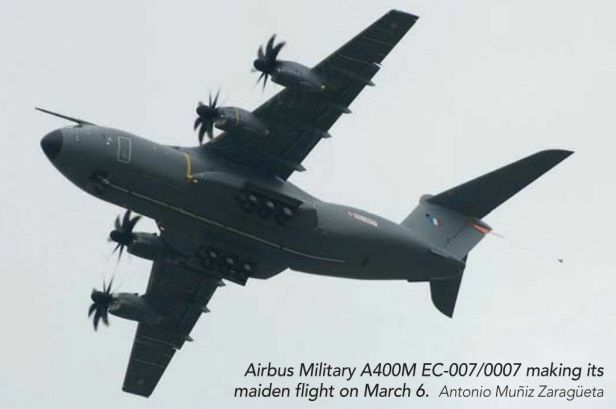 Airbus Military A400M EC-007/0007 making its maiden flight on March 6, 2013. 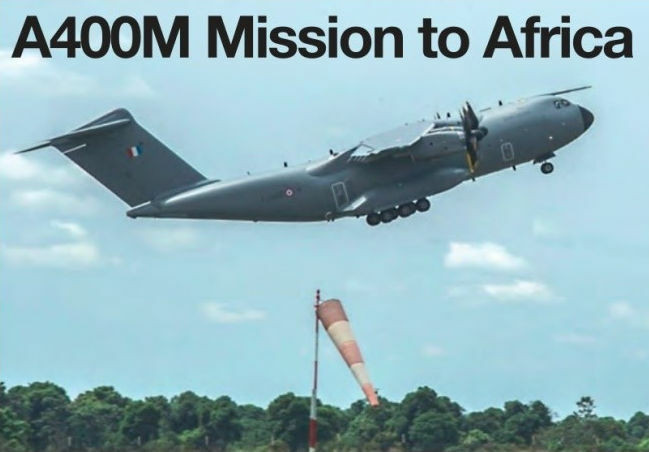 The Armee de l'Air has deployed one of its Airbus A400M transports to the Central African Republic (CAR) for the first time. 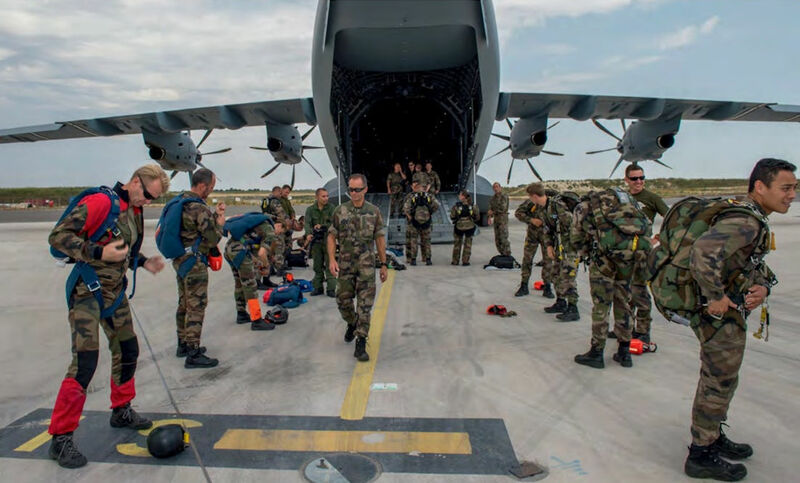 The aircraft departed its home base at Orleans-Bricy and flew on to N’Djamena in Chad before landing at Bangui Airport on November 7, 2014 and unloading 7.4 tons of supplies for Operation Sangaris forces. The aircraft is pictured departing Bangui. 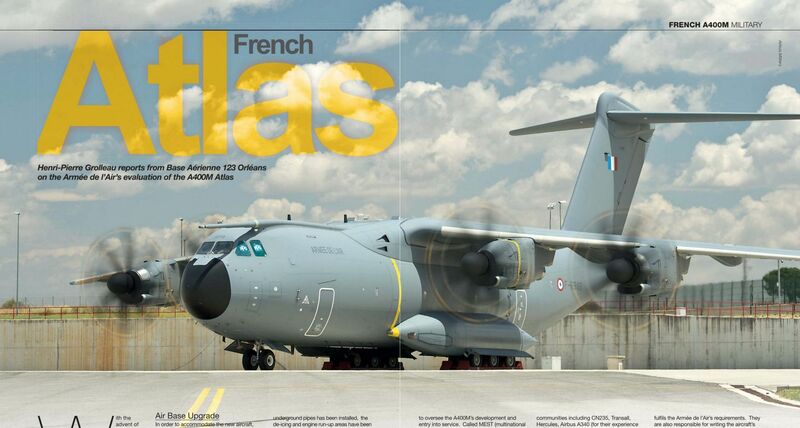 The first A400M Atlas for the Armee de I’Air, 0007, during a test flight from Seville-San Pablo Airport. 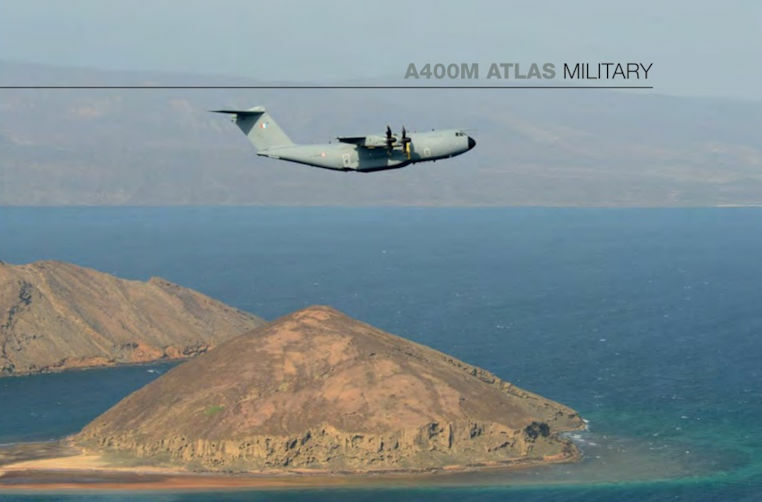 Armee de I'Air A400M 0008/F-RBAB photographed over a typical coastal landscape in Djibouti. 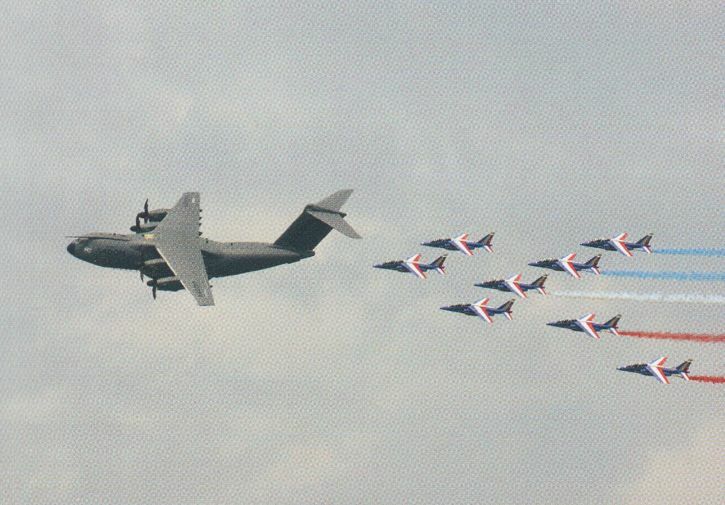 An A400M dropping paratroopers at Tarbes, southern France. 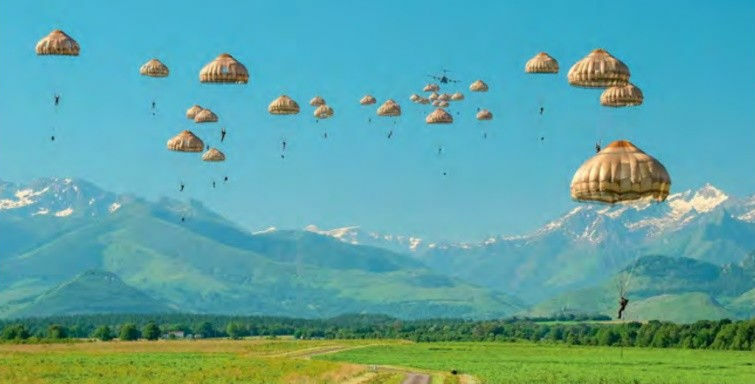 Qualification of the aircraft for dropping paratroopers is part of a two-step programme to address issues over the aircraft’s tactical capabilities. The difference in size between the Transall and the Atlas is obvious in this shot. 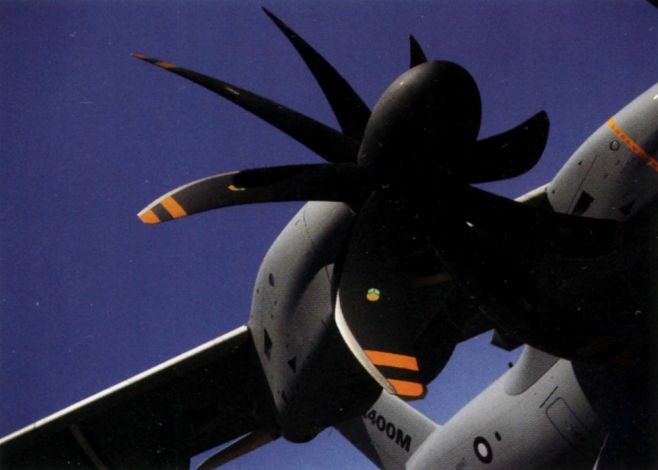 The mandatory checks of the propeller gearbox every 50 flying hours are interfering with the serviceability of the A400M fleet. 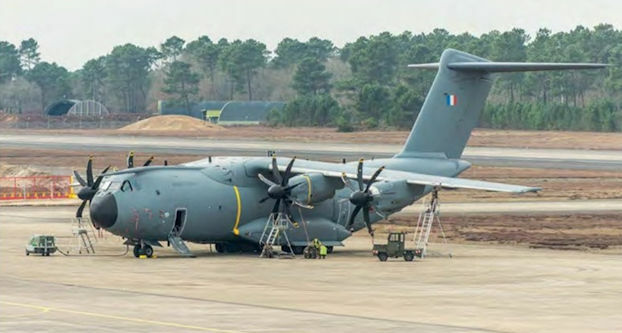 A400M 0037/F-RABJ (msn 037), the first operational A400M to participate in Exercise VOLFA undergoes inspection at Mont-de-Marsan after a triple bird strike to its left wing. 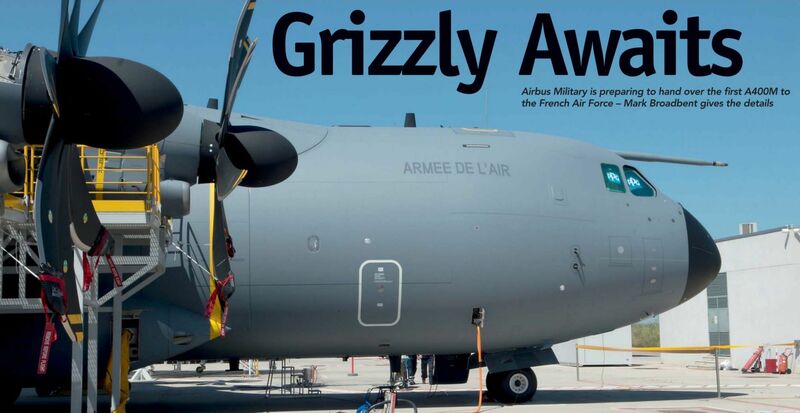 While the C-160 celebrated its 50th anniversary with the Armee de I’Air on October 5, 2017, the A400M is slowly coming of age. The Centre d'Experiences Aeriennes Militaires is the lead unit for the new airlifter's service introduction. Cold weather trials proved successful. 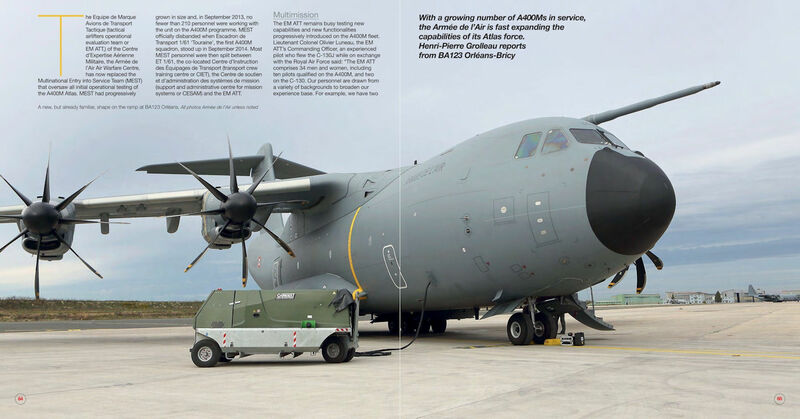 The A400M is progressively taking an expanding role in Africa - the type offers twice the speed, twice the endurance and twice the load as a Transall. 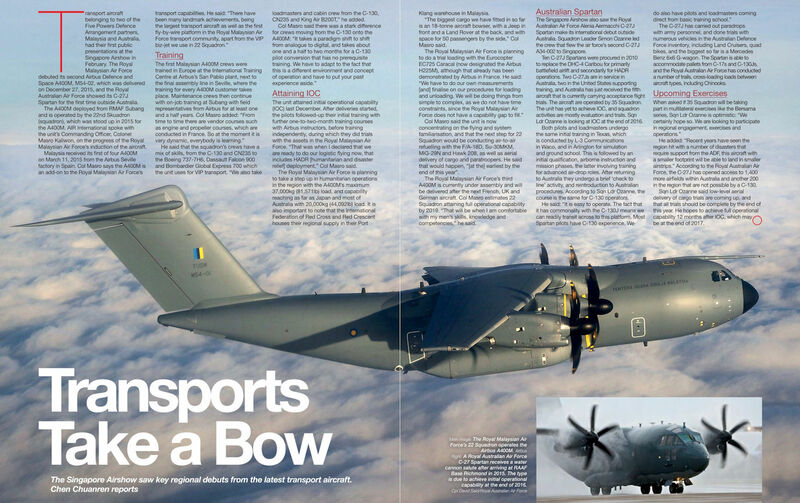 The A400M is slowly coming of age, as aerial refuelling capabilities are going to be tested in the coming year. 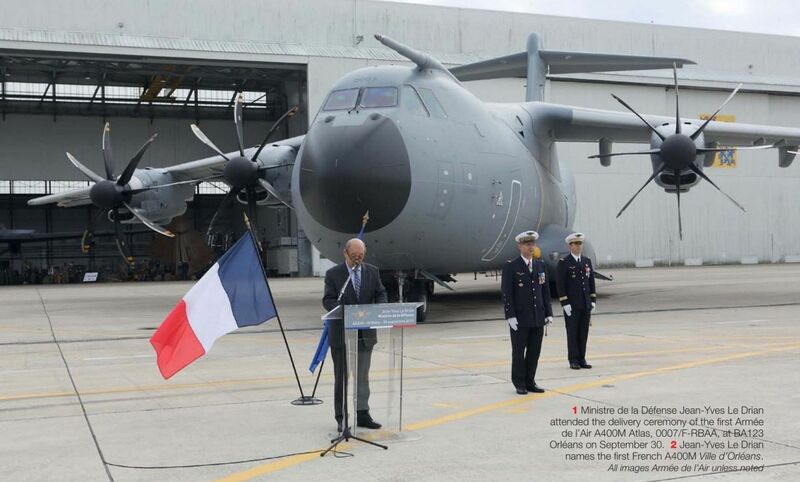 Jean-Yves Le Drian names the first French A400M Ville d'Orleans. 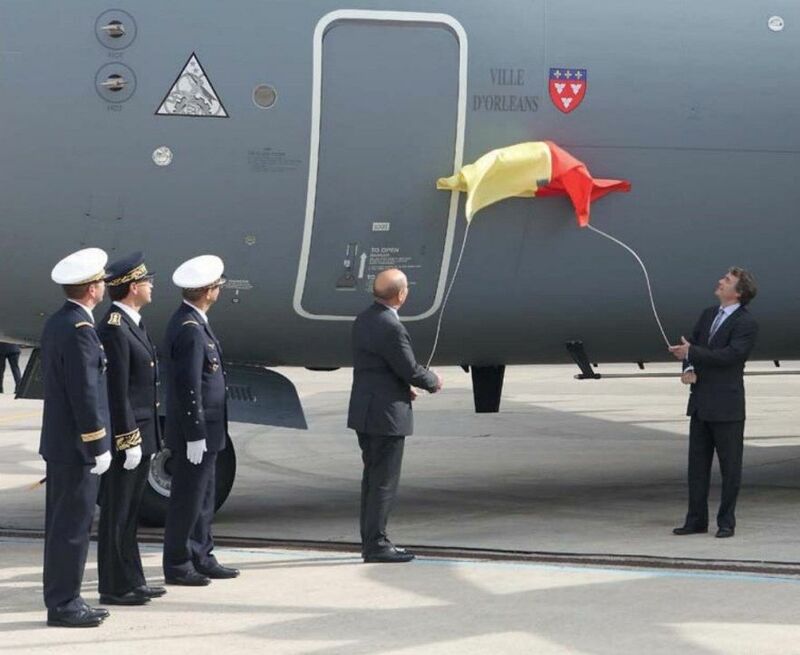 Ministre de la Defense Jean-Yves Le Drian attended the delivery ceremony of the first Armee de l’Air A400M Atlas, 0007/F-RBAA, at BA123 Orleans on September 30, 2013. A new, but already familiar, shape on the ramp at BA123 Orleans. 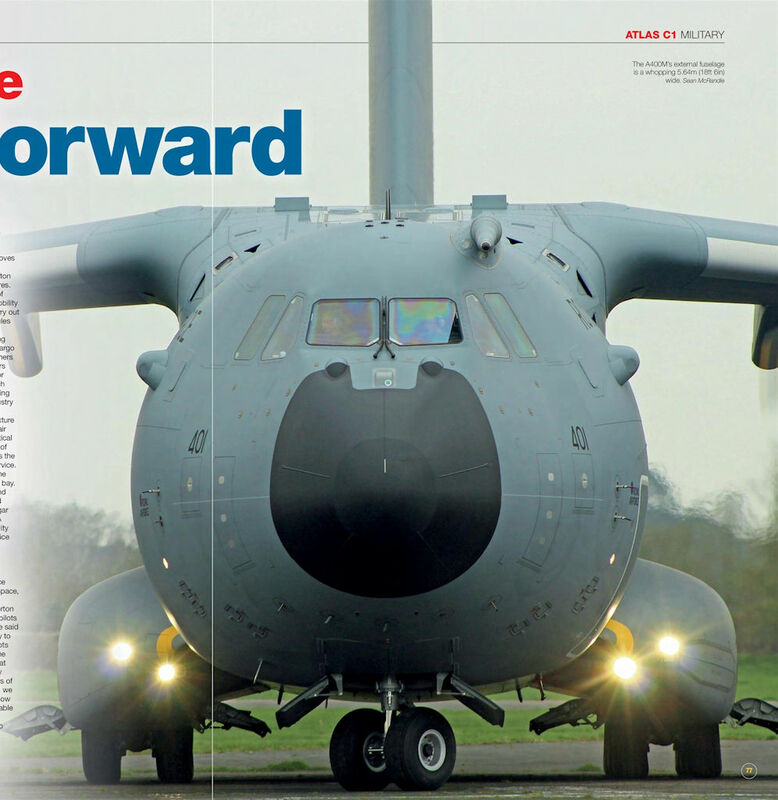 Investigating and then resolving engine issues has severely curtailed deliveries of A400Ms. Priority has been given to modifying the engines of in-service aircraft, meaning that deliveries will continue to be disrupted for some time. During the mission around the world, the Armee de I’Air took the opportunity to test Atlas accessibility to a number of French bases, including BA186 Noumea. Paratroopers get ready for a drop from 12,000ft at BA123 Orleans. 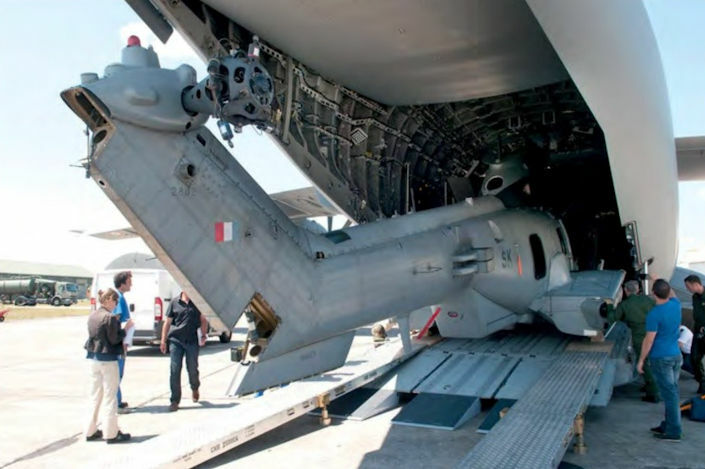 A French Air Force EC725 Caracal loaded onto an Atlas at BA120 Cazaux. 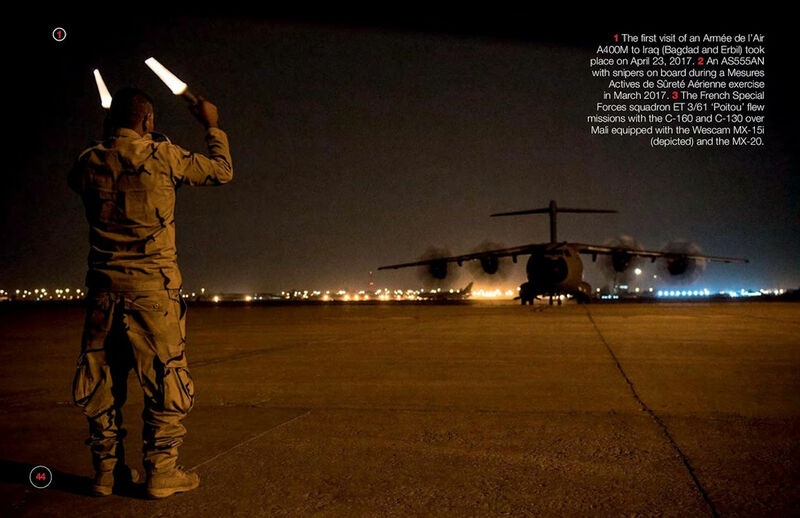 The ability to quickly airlift special forces helicopters to hot spots is a welcome capability. 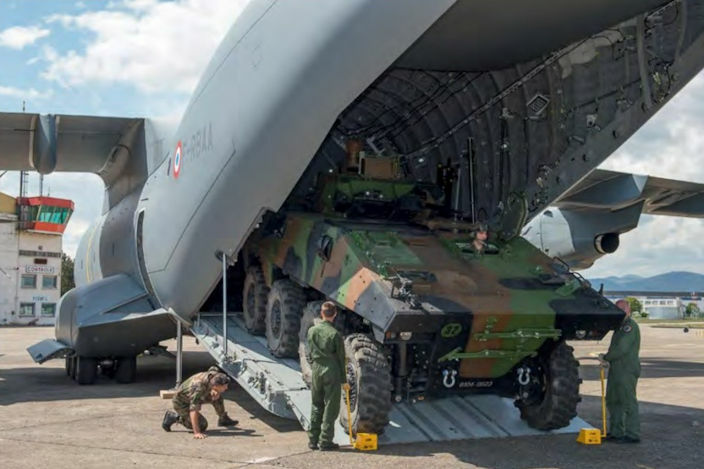 Even some of the largest French Army vehicles, such as this infantry armoured combat vehicle, can be carried by the A400M. 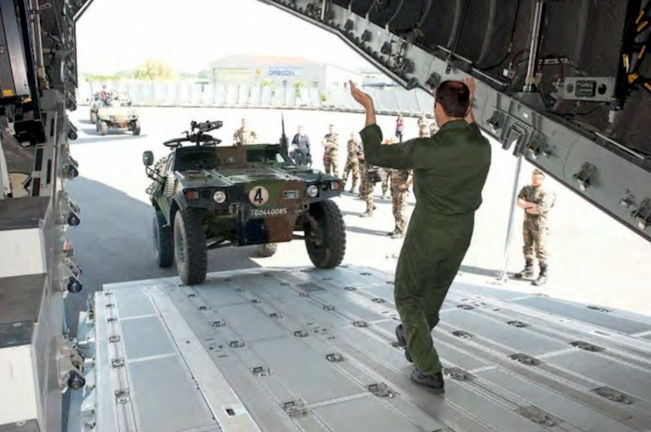 An armoured vehicle, is precisely marshalled into the Atlas' large cargo hold. 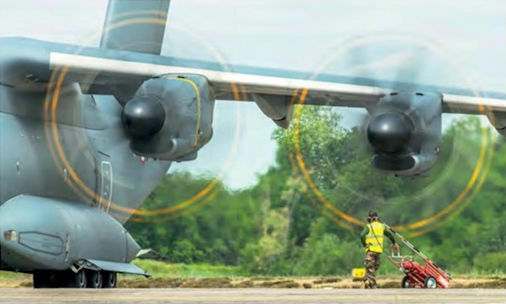 An A400M being refuelled at BA123 Orleans. 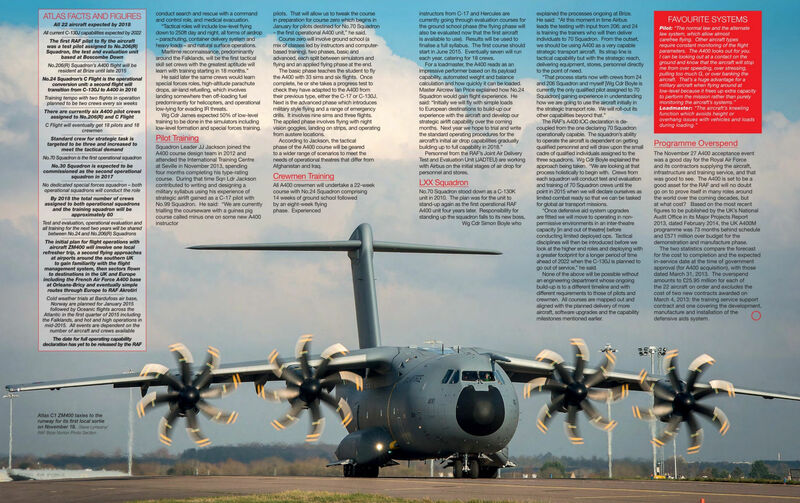 All A400M maintenance procedures were tested by the CEAM and maintenance task cards were produced by its specialists for use by front-line operators. 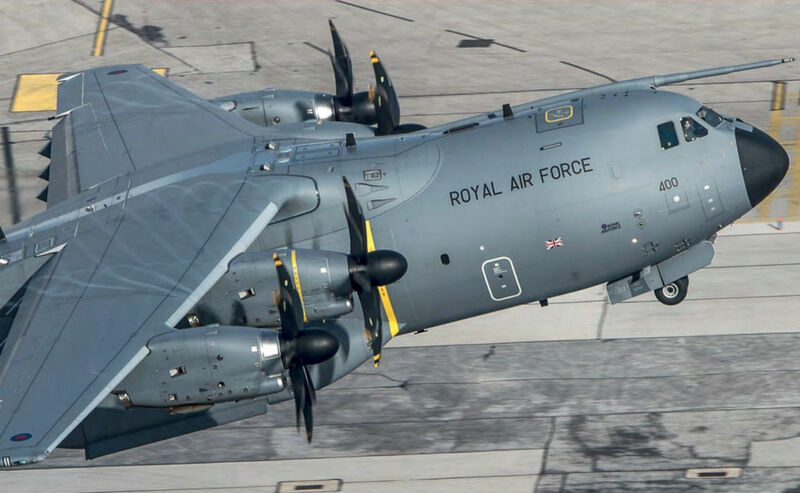 Atlas C1 ZM400 on the dispersal at RAF Brize Norton on November 18, 2014 following its first local sortie. No.70 Squadron A400M Atlas C1s operated between RAF Brize Norton to Keevil in Wiltshire, seen here, and Woodbridge airfield in Suffolk in support of 16 Air Assault Task Force during Exercise Joint Warrior 17-1 in March 2017. 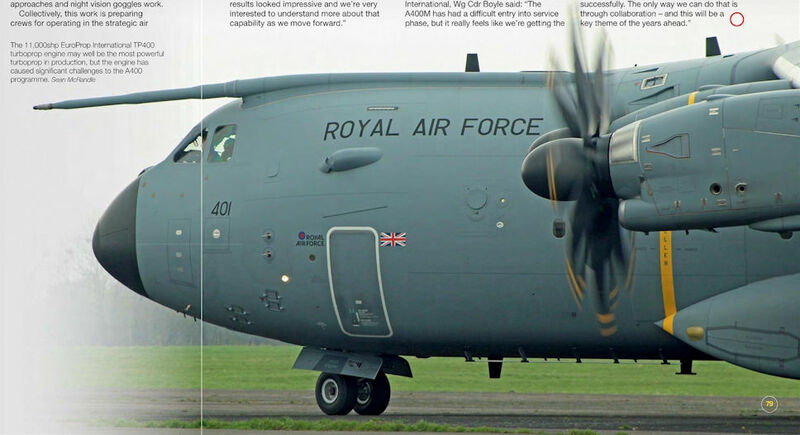 No.24 Squadron C Flight is the A400M Operational Conversion Flight. 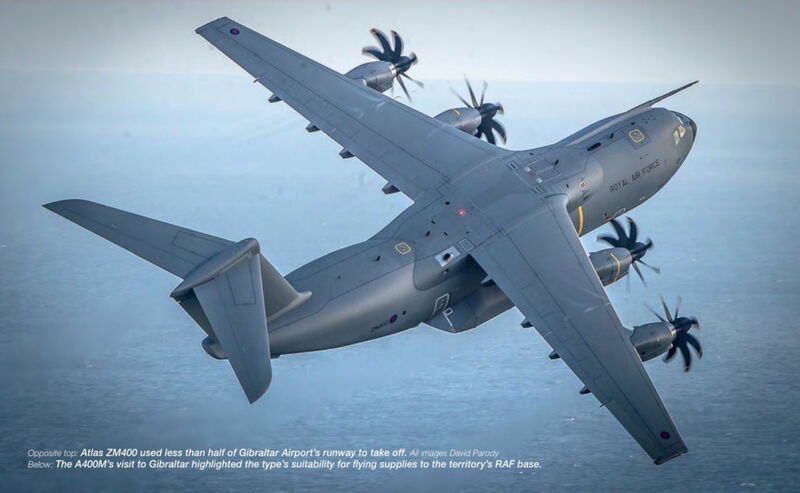 The 11,000shp EuroProp International TP400 turboprop engine may well be the most powerful turboprop in production, but the engine has caused significant challenges to the A400 programme. 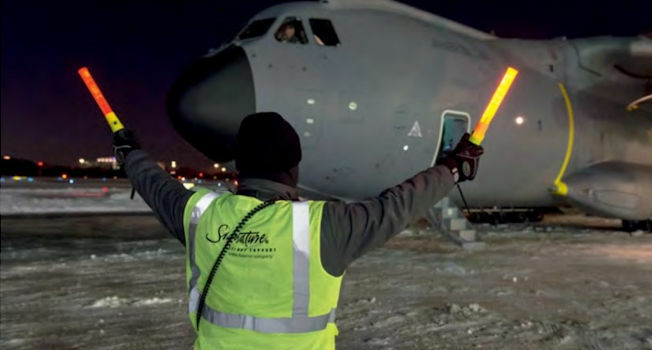 The crew of Atlas C1 ZM400 are marshalled to parking following its first local sortie on November 18, 2014. 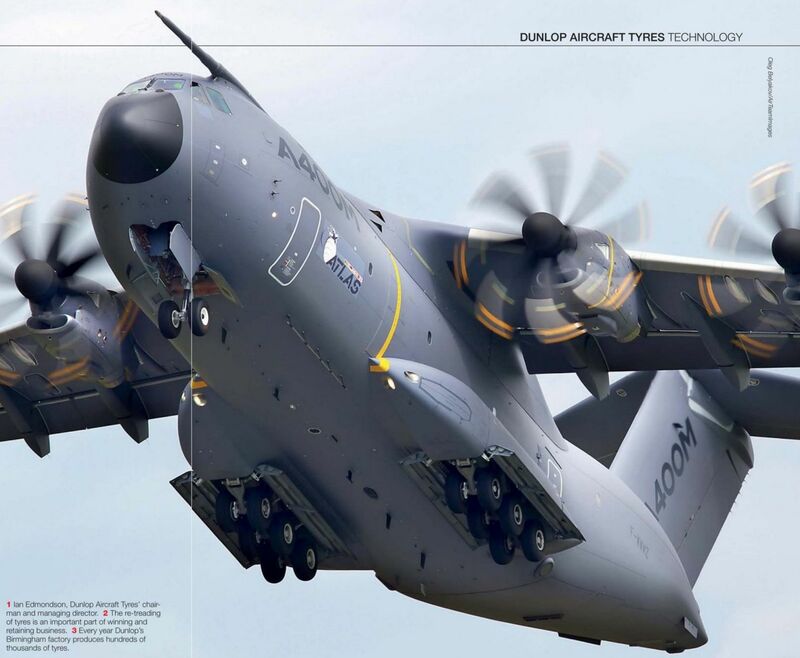 The A400M's external fuselage is a whopping 5.64m (18ft 6in) wide. Atlas C1 ZM400 taxies to the runway for its first local sortie on November 18, 2014. Atlas C1 ZM401 at Keevil Airfield, Wiltshire. Atlas C1 ZM401 at Avalon. 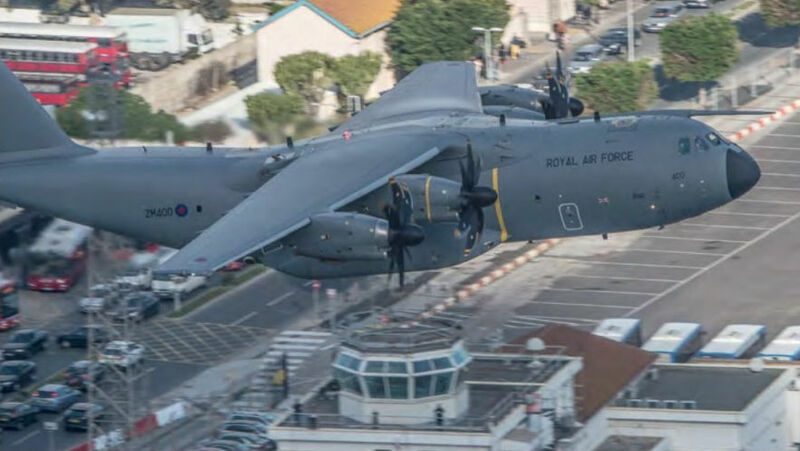 Atlas ZM400 used less than half of Gibraltar Airport’s runway to take off. 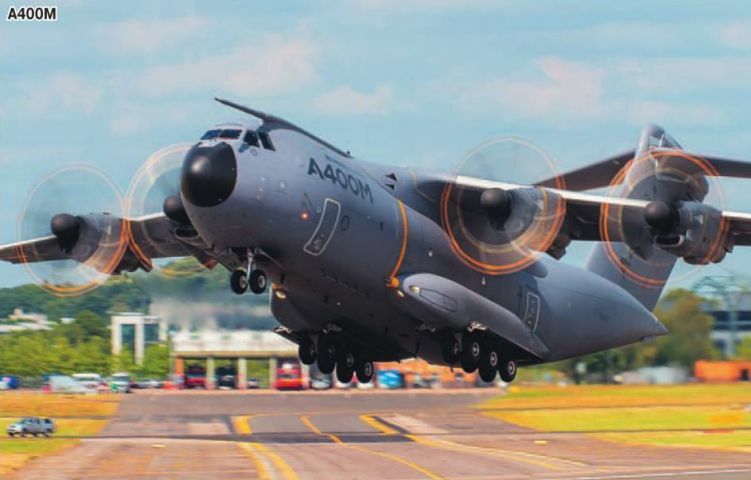 Airbus Defence and Space A400M Atlas EC-405 lifts off for the first time from Seville-San Pablo Airport in Spain on August 30, 2014. 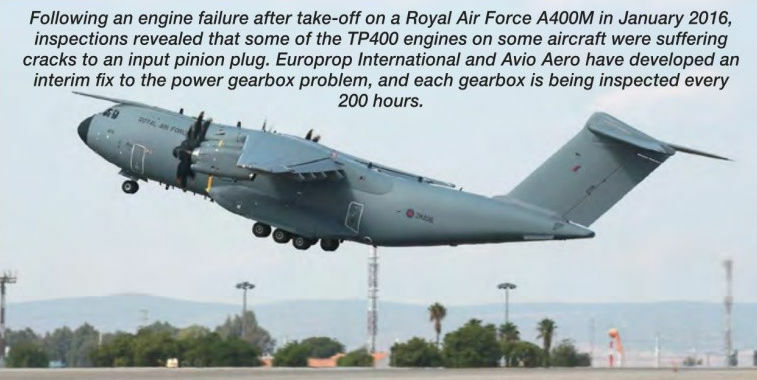 Following an engine failure after take-off on a Royal Air Force A400M in January 2016, inspections revealed that some of the TP400 engines on some aircraft were suffering cracks to an input pinion plug. 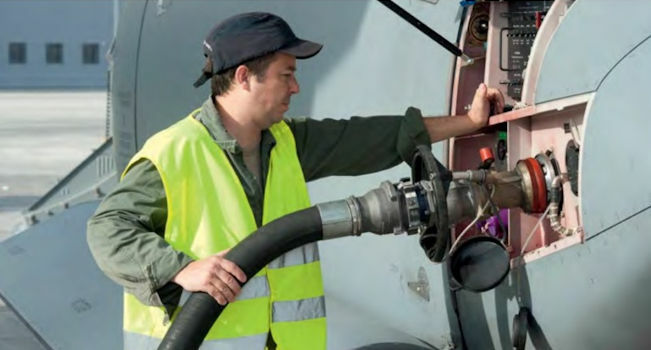 Europrop International and Avio Aero have developed an interim fix to the power gearbox problem, and each gearbox is being inspected every 200 hours. RAF Atlas C1 ZM408 departs Joint Base Lewis-McChord on a mission during the second half of Exercise Mobility Guardian. 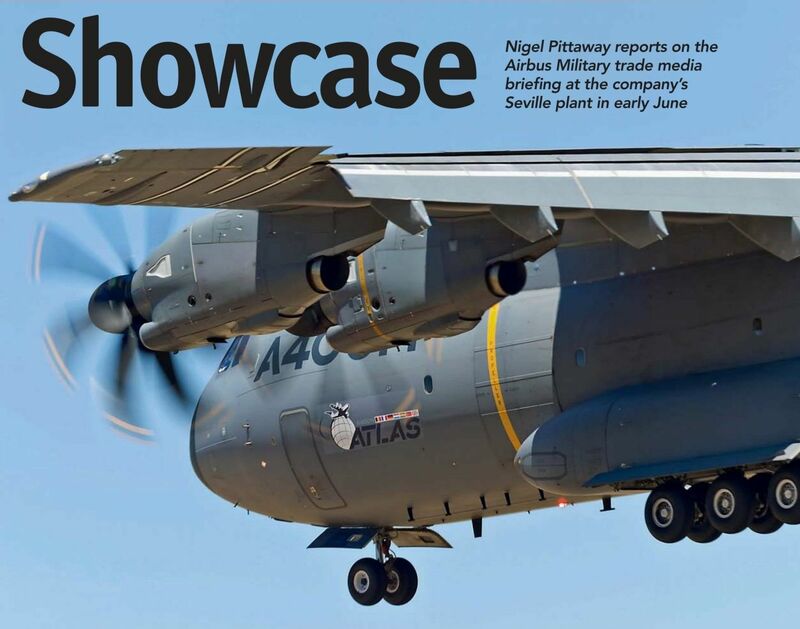 The A400M’s visit to Gibraltar highlighted the type's suitability for flying supplies to the territory’s RAF base. Atlas C1 ZM409 performed two approaches at Norwich International Airport on March 23, 2017. The aircraft currently has anniversary tail markings for the British Army’s Airborne Brigade with the legend ‘Airborne 16, 75 Years of the Airborne Brigade’. Royal Air Force A400M Atlas C1 ZM403 prepares to land at RAF Brize Norton, Oxfordshire, on the evening of July 5, 2015 after its delivery flight from Spain. 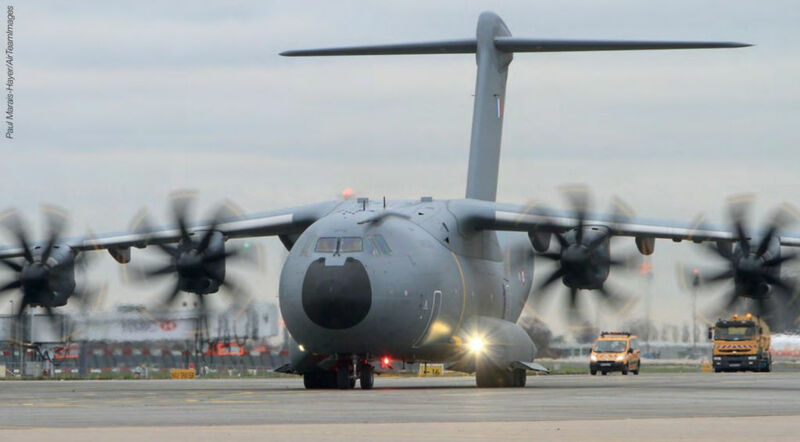 This was the third aircraft to enter service with the RAF and the first to arrive since clearance was given to resume deliveries following the fatal crash of the third Turkish A400M on its maiden flight on May 9. 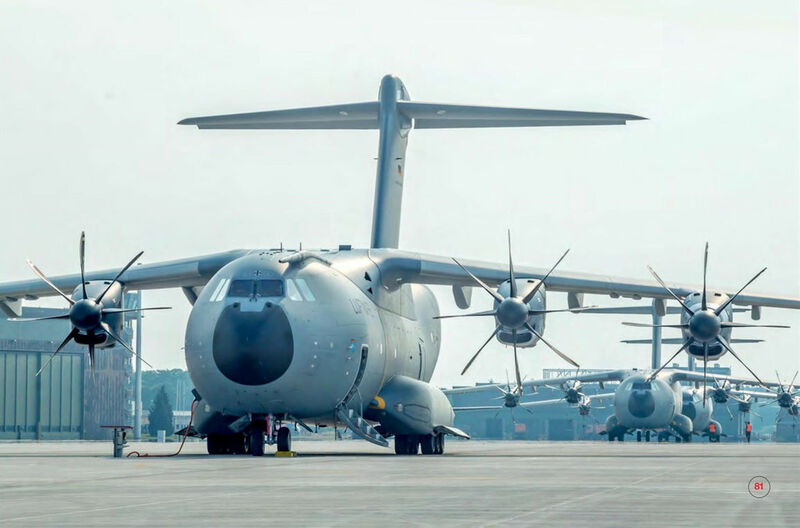 Taxi tests of the first Airbus Defence and Space A400M for the Luftwaffe (54+01, msn 18) began on October 12, 2014 at the manufacturer’s facility in Seville, Spain. The transport was painted in Luftwaffe colours two days earlier. 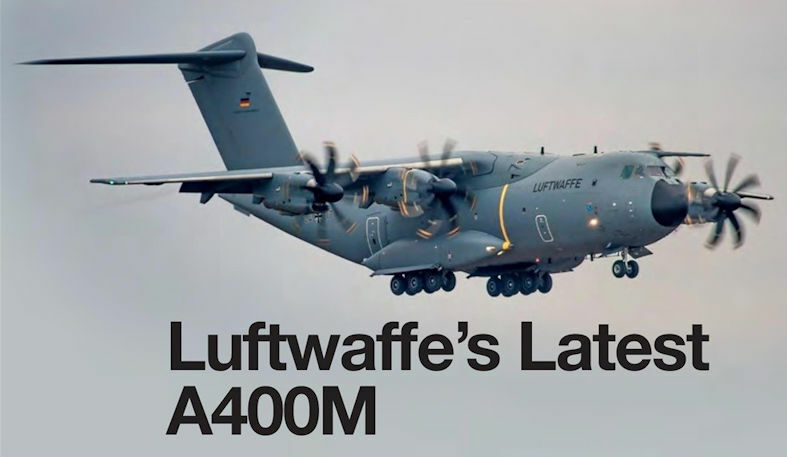 The first Luftwaffe A400M 54+01 made its first flight on October 14. 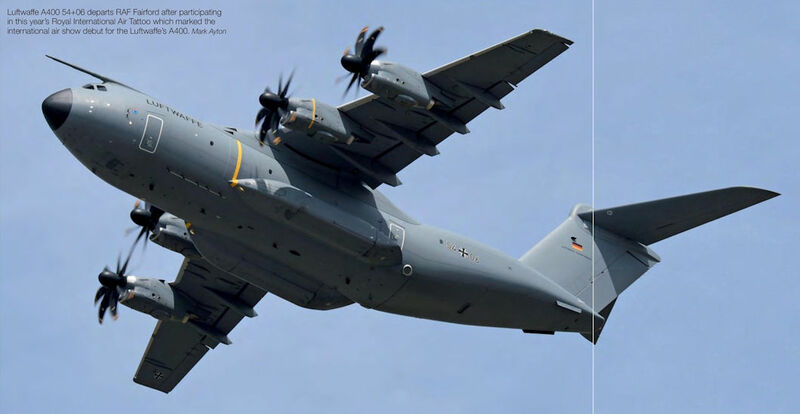 Luftwaffe A400M 54+07 is seen landing at Cologne Airport on February 1, 2017 to collect material and personnel for airlift to Pristina, Kosovo and Incirlik Air Base in Turkey. 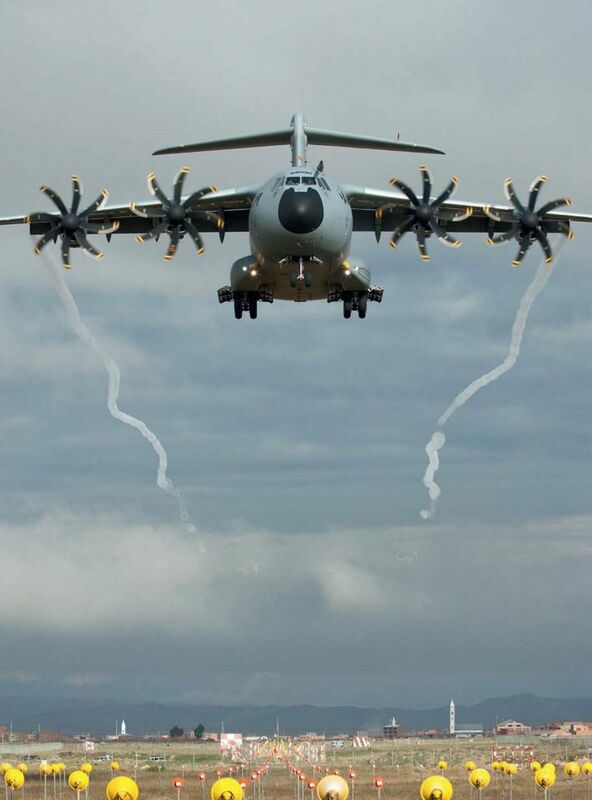 The Royal Malaysian Air Force’s 22 Squadron operates the Airbus A400M. 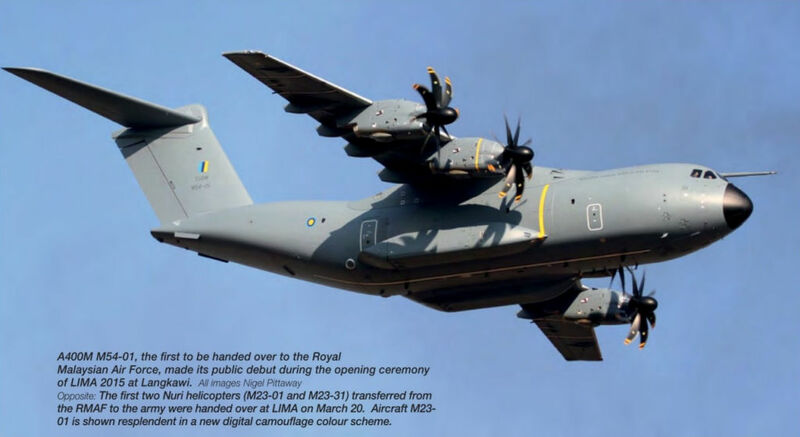 The first of four Airbus A400M Atlas airlifters (M54-01, msn 022) for the Royal Malaysian Air Force seen during its maiden flight from the manufacturer's facility in Seville on January 20, 2015. 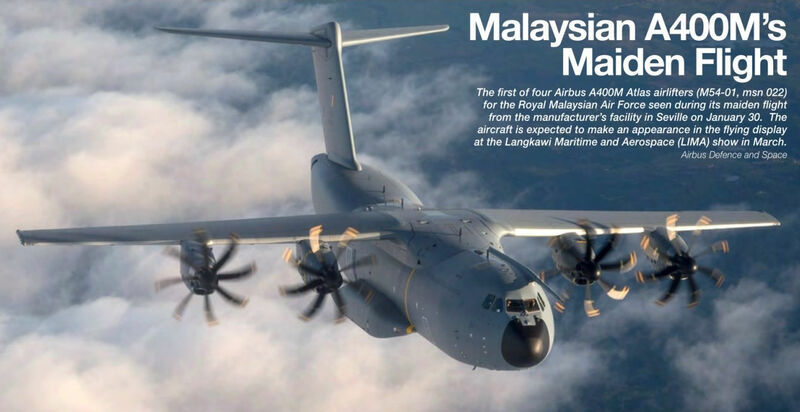 The aircraft is expected to make an appearance in the flying display at the Langkawi Maritime and Aerospace (LIMA) show in March. 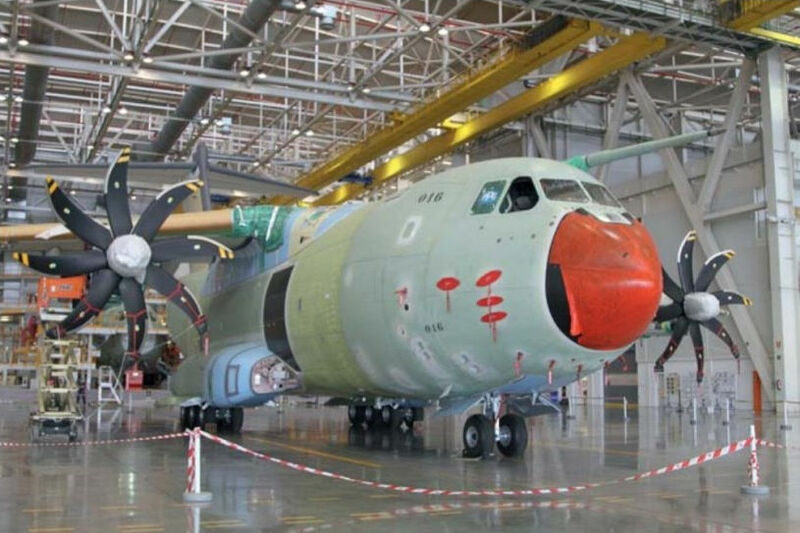 The first A400M for the Ejercito del Aire (MSN44) after leaving the Seville Final Assembly Line ahead of its first flight. 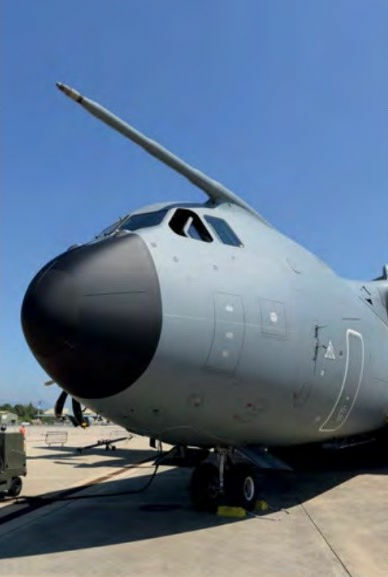 On December 1, 2016, the Ejercito del Aire (Spanish Air Force) received its first Airbus Military A400M Atlas, registered T.23-01(10074) 131-21 at Seville-San Pablo. 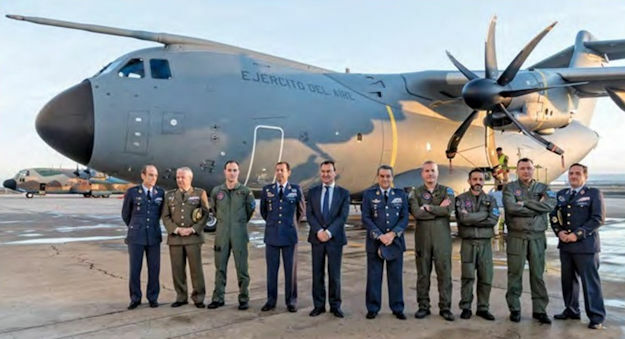 After the formal handover ceremony in San Pablo, the aircraft took off for a 50-minute flight to its new home at Zaragoza Air Base, to serve with Ala 31 currently equipped with ten C-130H and KC-130H Hercules. 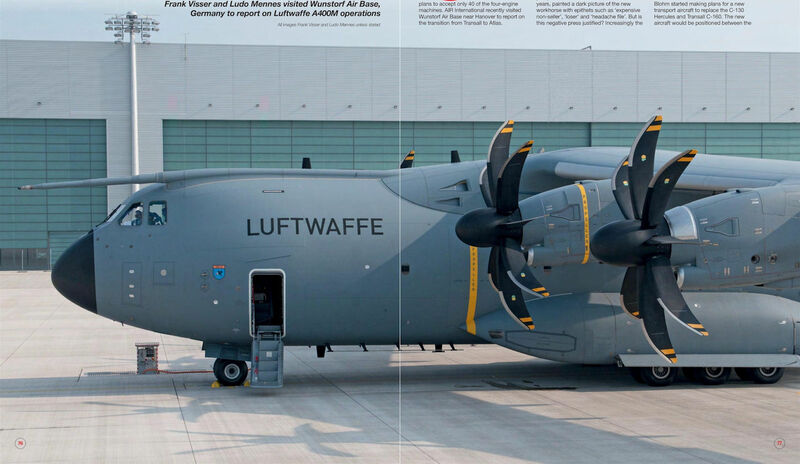 The aircraft is shown parked in front of anew hangar purpose built for the A400M. 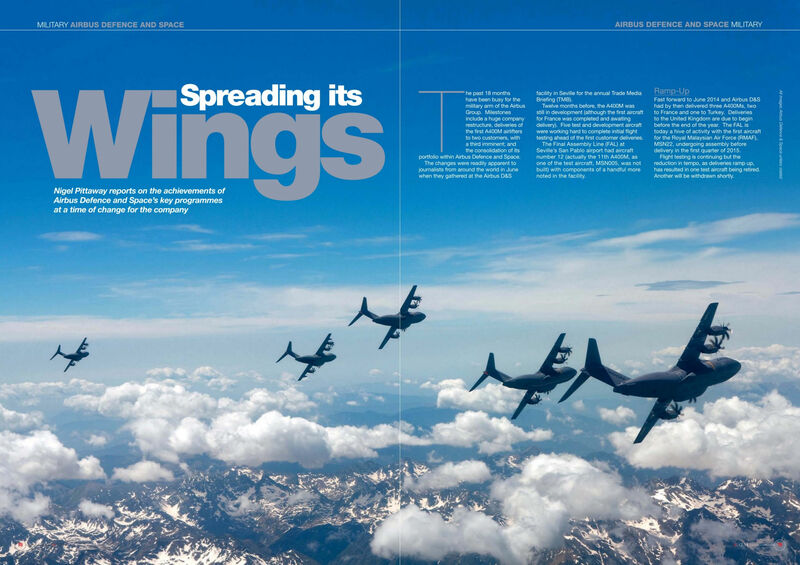 The Ejercito del Aire expects to receive 14 A400Ms through to 2022 and another 13 from 2025. 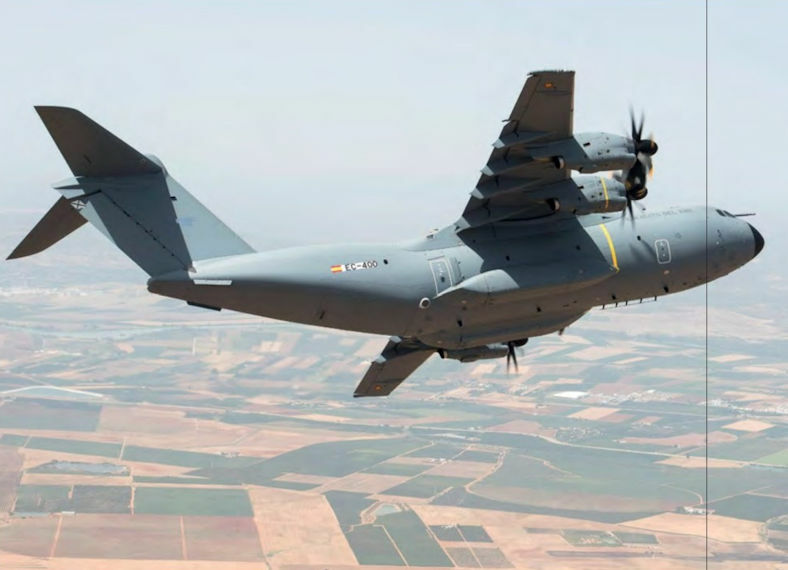 September 6, 2016 saw the first Ejercito del Aire (Spanish Air Force) A400M Atlas (msn 44, to be T23-01 - 10074/31-21) undertake its maiden flight, a three-hour, 45-minute sortie from Seville over the Mediterranean Sea. 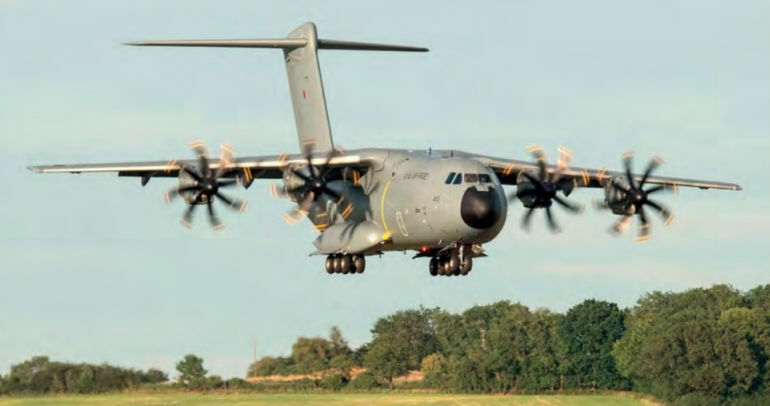 The flight followed shortly after the A400M demonstrated its ability to operate on a sand runway on a specially-constructed 1,600m (5,250ft) strip at Woodbridge, UK. These tests followed earlier successful results on the gravel surface at Ablitas in Spain and a grass runway at Ecury in France. 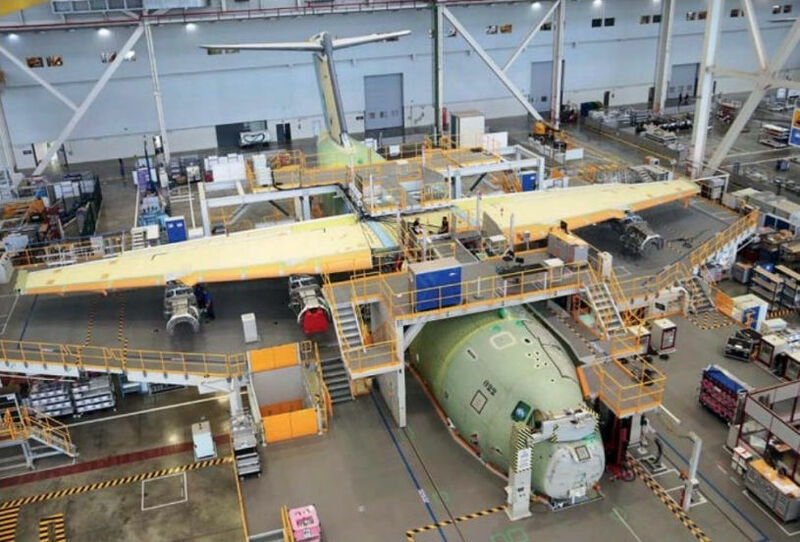 Nine A400Ms were in the delivery process at the end of October 2015, including MSN28 for Turkey, seen here in the background. 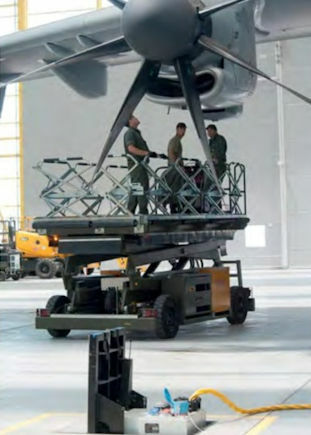 Airbus Military uses some fancy covers to tether the A400M's propellers. 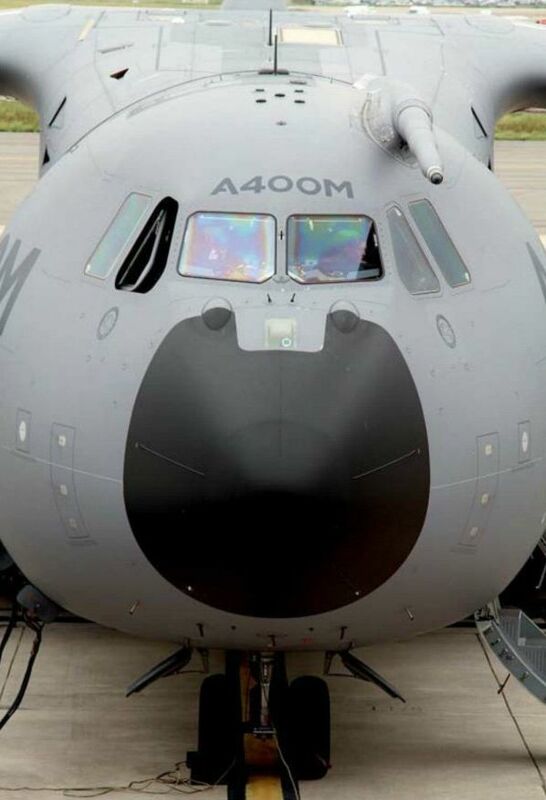 Airbus Defence and Space A400M msn 15, the first destined for the RAF, during its initial taxi trial on August 10, 2014. Airbus Defence and Space Military A400M A4M013 (msn 013) completed its maiden flight at Seville-San Pablo Airport, Spain, on July 30, 2014. The aircraft made a 3 hour 20 minute test flight over the Alboran Sea, off the coast of Granada, after which the transport landed safely back at Seville. The number four Europrop TP400 turboprop was unpowered for the landing approach, possibly intentionally as part of the test programme. 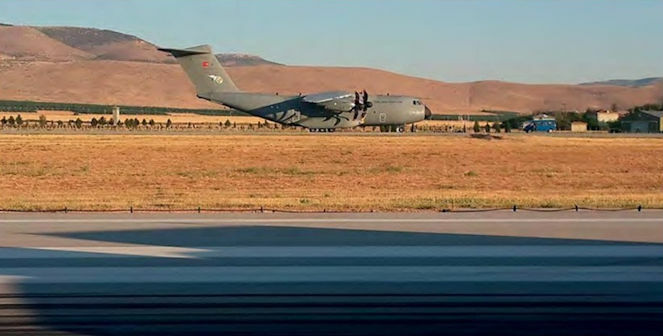 The transport is the second example for the Turk Hava Kuvvetleri (Turkish Air Force). 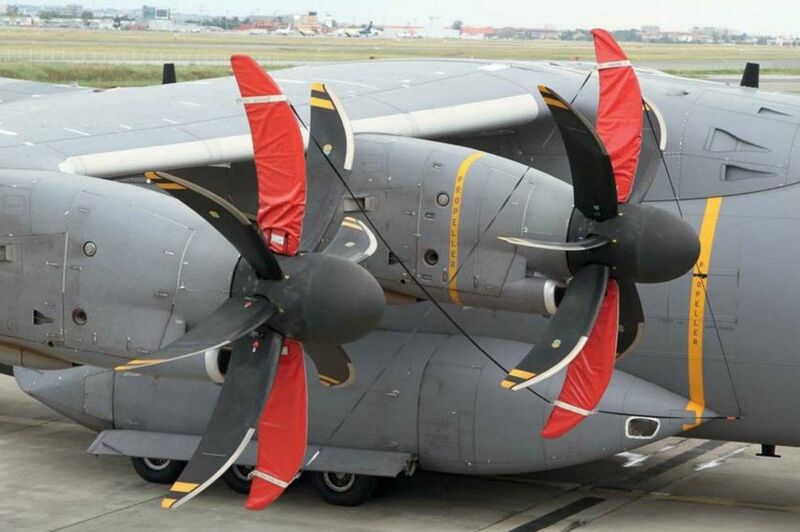 The first A400M for Turkey (13-009, msn 009) was accepted on April 4 and entered service with 221 Filo ‘Esen’ at Kayseri-Erkilet 12 days later. 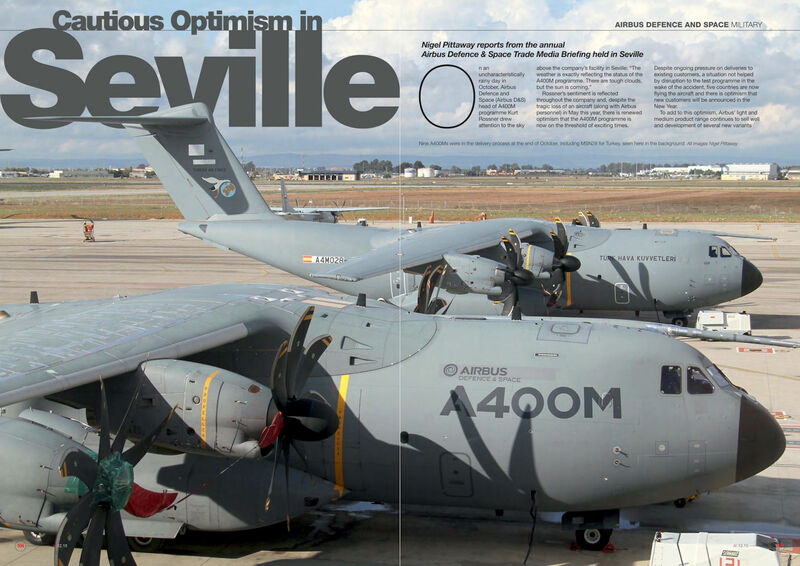 The A400M's Final Assembly Line in Seville has seen a ramp-up in activity over the last year. 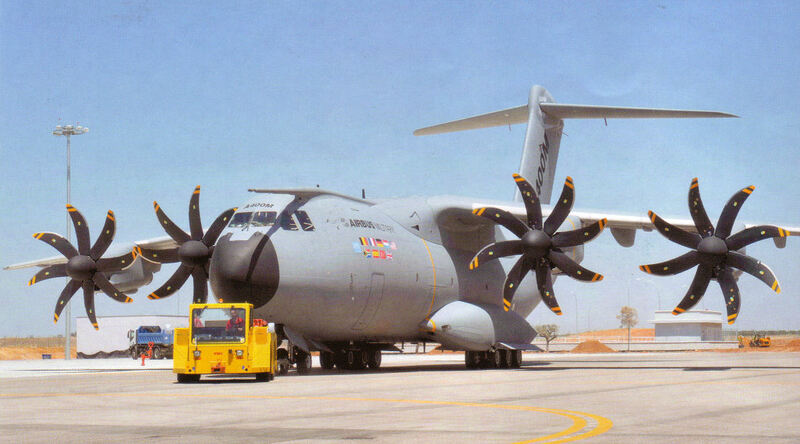 MSN22, the first Malaysian A400M, in assembly at Seville.